Icke — whose theories range from extraterrestrial lizard people controlling the earth, to the September 11 terror attacks being an inside job — was due to undertake a two-week speaking tour of Australia off the back of his latest self-published book. 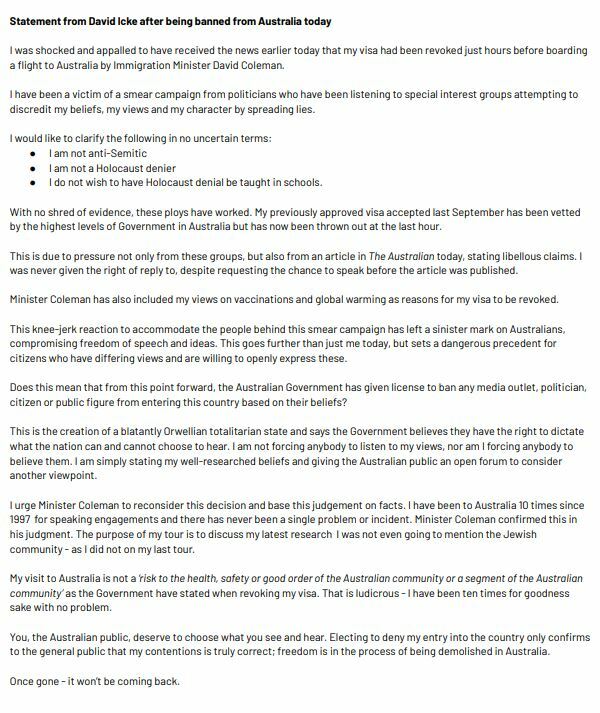 However, 10 understands Immigration Minister David Coleman has cancelled Icke’s visa at the eleventh hour. The Immigration Department said it does not comment on individual cases. In a statement, Icke said he was “shocked and appalled” to have been “banned”, claiming he had been the victim of a “smear campaign from politicians”. “I am not anti-Semitic. I am not a Holocaust denier. I do not wish to have Holocaust denial be taught in schools,” he said. The newly formed seat of Macnamara includes St. Kilda, which saw alt-right groups rally and give the Nazi salute earlier this year. “Today’s welcome news reaffirms the Morrison government’s steadfast support for the Jewish community and Holocaust survivors, many of whom live in Macnamara, including my grandparents,” Ashmor said. Photo: David Icke’s 1995 book, And The Truth Shall Set You Free, which laid out his conspiracy theories around Jewish people. It comes after the Anti-Defamation Commission launched a campaign in early January to have Icke’s visa revoked. The ADC’s Dr Dvir Abramovich praised Coleman’s decision. “This was a defining moment for who we are as a nation, and we salute the government for taking a clear-eyed and moral stance in rejecting hate and incitement,” he said. Icke said those with tickets to the speaking tour will be contacted on Thursday.